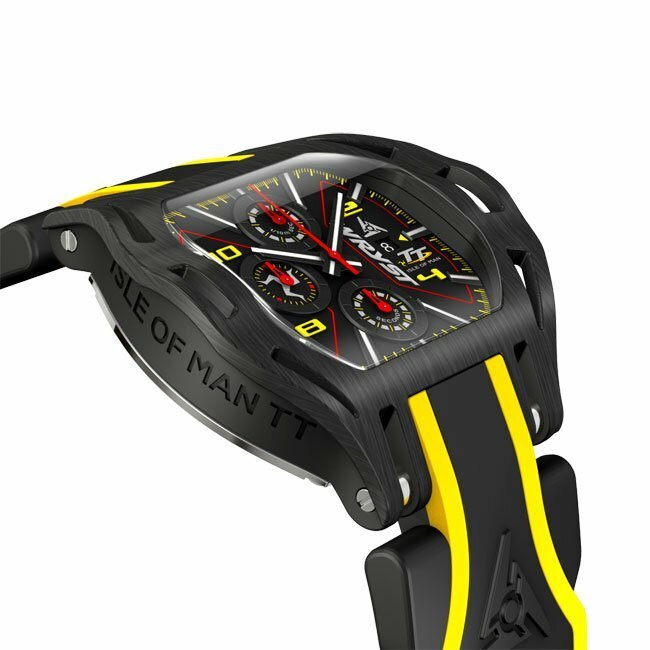 The Wryst Isle of Man TT watch celebrates the "best motorsport show on earth". Now on low stocks! This Wryst TT watch is bolder, stronger, and more masculine than ever with a large 50mm size. An ideal Swiss chronograph for racers and bikers. 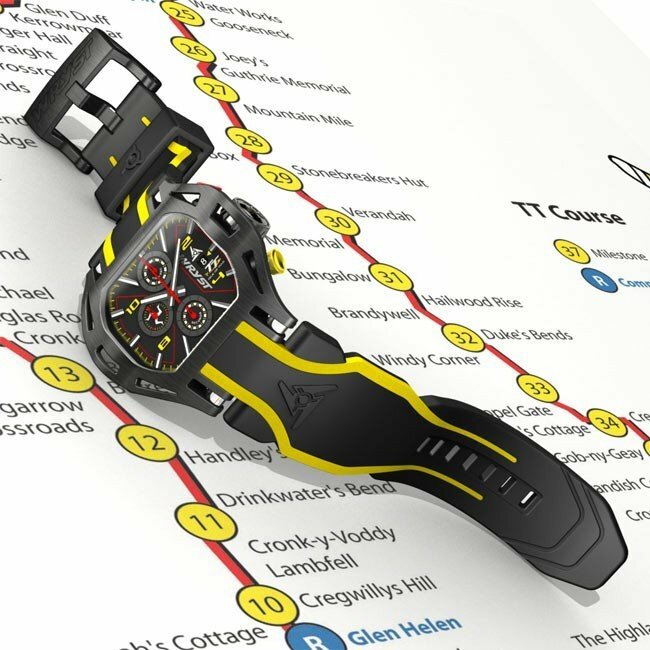 Produced exclusively in a special edition, the sports watch brand Wryst pays tribute to the fastest motorbike road race in the world, the Isle of Man Tourist Trophy. The newly designed chronograph dial is now revealed under a 2.5mm thick sapphire crystal. The face of the watch is somehow slightly similar to the previous TT watch but let's take a closer look. The new hour markers are now solid applied indexes. There is still on the dial the Isle of Man triskelion inside the 9h subdial. Overall the watch showcases a more mature and sincere motorsport feel. This special edition has the serial numbers are engraved on the case back starting at #001. 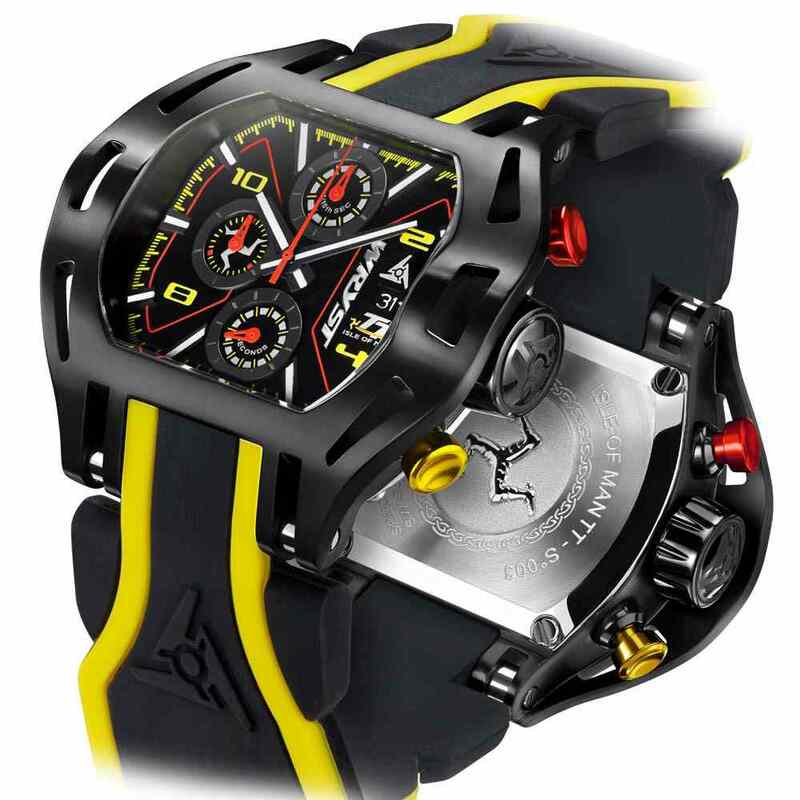 With a high-tech bicolor black and yellow 4.5mm thick silicone strap, this is the ideal chronograph for motorcycle and superbike riders. 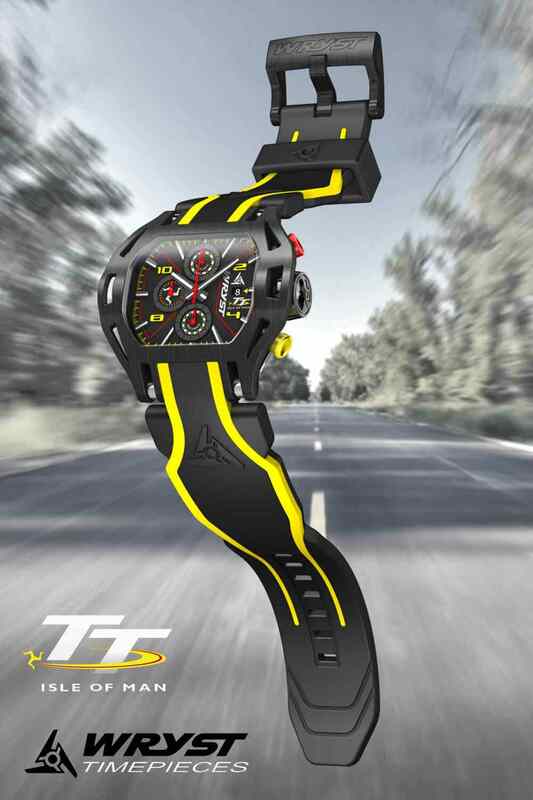 The Wryst TT sports watch has black 'Diamond-Like Carbon' coated 50mm case, crown, and 25mm buckle. Used in F1 race cars engines and aerospace, the DLC technology provides incredible hardness making it the most resistant black sports watch in the world. The previous "K1" TT watch glass is now also replaced by a thick sapphire crystal with anti-reflective coating. 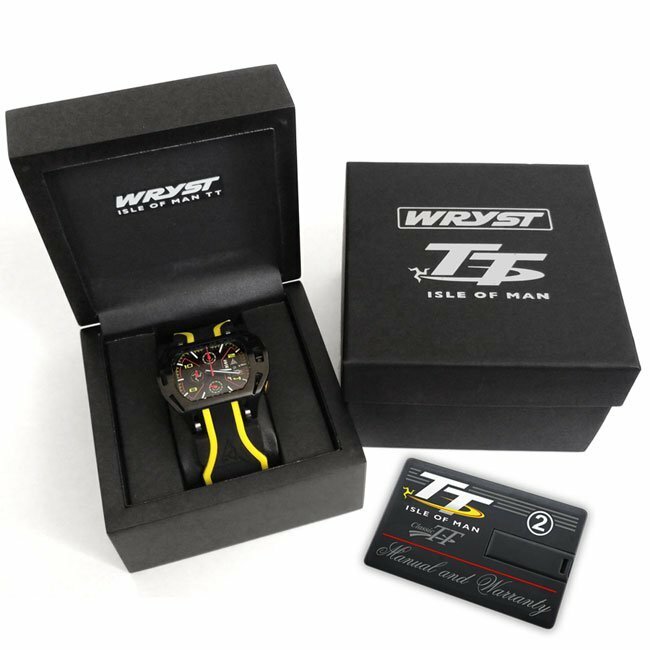 Order today your exclusive Wryst Isle of Man TT watch! I love my new TT watch thank you very much. - Drake, biker addict. Fan of the TT races and fast bikes in general I bought this watch straight away. It's a good size watch which is great for me. I wear big! 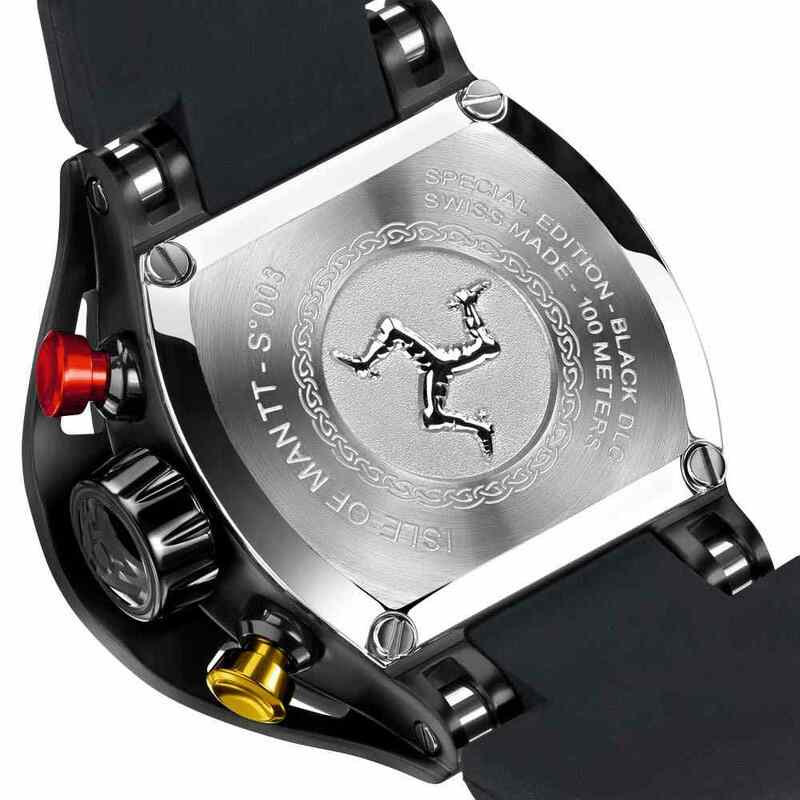 The back of the watch is also cool with the Isle of Man triskelion which is well made. Overall the quality is impeccable and of highest standards than expected. Never heard of the brand before but I may buy another one in the future. I have been waiting over 5 months for this watch. Worthwile the wait - This watch is truly well made. The pictures are bright and colorful on the site but they just match reality perfectly. Bold watch and I only receive compliments. Hightly recommended purchase! Joshua P.
I was so overwhelmed after receiving the first Wryst TT from 2016! Just placed an order for this one too. Will be waiting patiently. Thank you for creating these superb sport watches.